This summary was contributed by Sue Annan @sueannan on her blog and is reposted here with her kind permission. Special thanks to her, as she did not take part in the chat itself but readily volunteered to write for us!! There was an element of indecision about Wednesday 31st October’s lunchtime #ELTchat. As the question setter was not present, those present were left to interpret the topic. Yohimar: Today is about performance teaching. But what is it, I wonder? Marisa_C: Are we talking about performance teaching or something else? Performance teaching as in: Teacher at centre stage prancing around being exciting vs. being quiet and laid back. Marisa_C: Or, How do we balance performance teaching with quiet laid back learner-centred moments? OUPELTGlobal: Are we talking performance as entertainment value in the classroom? Marisa_C: Everyone is talking about performing in class, but is it about keeping up appearances? Like looking professional – dress code, distance or not to Ss? This led to the discussion going down a number of different paths. @Shaunwilden asked how many of the teachers present were performers. The answer was: quite a few! @esolcourses and @Shaunwilden suggested that we all play to the crowd from time to time. @teflgeek suggested getting to know the audience before deciding on your role. @Wiktor_K said that outside work he rarely behaves the way he does in the classroom. @jo_cummins admitted that the performance adrenaline is what keeps her going on her ‘off’ days and I feel sure that many of us can relate to that. She also mentioned the fact that there seem to be a number of people with a drama background in teaching! @teflerinha said there was an element of ‘putting on the teacher’s hat’ but that students should be centre stage. @prese1 said that she didn’t always feel cheerful going into class, but you have to paint the smile on and get on with it. As @esolcourses put it; business as usual! teflerinha, in receipt of a Drama degree herself, thought that teaching was actually more like directing than performing. She found that accepting criticism on her performance was the biggest crossover from her drama course. Julian_LEnfant suggested that the role might be that of Conductor, which teflerinha disliked, as she thought that most of the work was done offstage, butShaun made the point that a conductor allows individual instruments to be highlighted. esolcourses agreed that a performance background could help with issues of confidence. She also believes that audience participation skills are needed, as it is a difficult skill to learn to communicate with a group. teflgeek benefits from his drama classes as it helps him think about voice, posture, how to stand etc. Julian_LEnfant: Don’t we also play to our strengths? I was possibly more fun as a younger inexperienced teacher but have more substance now. Does this mean that new teachers have the monopoly on ‘fun’ over substance, or is this an overgeneralisation? theteacherjames was suspicious of the word ‘Performer’ and doesn’t believe it is advisable to perform in the classroom. He looks for honesty in the classroom and thought that performance suggested the opposite. He is not against drama techniques being used, per se, and OUPELTGlobal agreed that a good teacher needs to perform to a certain degree, but hopes teaching goes beyond that. teflgeek said it was more about putting your game face on. esolcourses thought James might prefer to look at it as presentation skills and classroom management. She said that, as a drama graduate, she found that many people adopt a ‘teaching personality’. esolcourses also thought that a larger than life, more confident version of one’s own pers onality would work, and not give the impression of being fake! It was agreed that, provided the character was based on the real person, then rapport would develop. SophiaKhan4 suggested that it just meant having a teaching personality separate from the personal one, which didn’t necessarily mean putting on a performance. James said that his personality didn’t change and that he felt he was a better teacher because of it. SophiaKhan4 said that she became more ‘serious and professional’ in class. groups of people in real life. occasion, as we serve as the communicative model for our students. jo_cummins noted that her teaching ‘persona’ is just herself on a good day! James also worried about the performance detracting from, or becoming more important than, the teaching. learning much. theteacherjames thought that having to be ‘engaging’ all the time seemed like a distraction to him and OUPELTGlobal thought that it was unnecessary pressure to try to be entertaining all the time. Yearinthelifeof: There’s a difference between being a good teacher and being a good laugh! OUPELTGlobal suggested that it might be a good idea to view the discussion in terms of ‘performance skills’ rather than performing. michaelegriffin agreed that performance skills are very helpful as the students are more likely to pay attention. Pysproblems81thinks that managing ‘performance’ is a useful skill for a teacher – but that doesn’t mean it has to be full-on all the time. Esolcourses thinks that using performance skills to motivate and interest students can be productive. Julian_LEnfant: We can train and develop a teacher’s teaching ability/knowledge, but coaxing personality out of someone is soooo hard. Prese1agreed: It would be difficult for a quiet person to be an extrovert in class. Marisa_C noted that quiet teachers are often in a better position to get students to participate more. Marisa_C and SophiaKhan4 agreed that different teachers achieve rapport in different ways and that one size doesn’t fit all. teflgeek asked whether a teaching performance is just putting aside the detritus of the day so that it doesn’t negatively affect ones classes. It is also a means of keeping a professional distance such as other professions do. It is wise to remember that the teacher is not supposed to be the star of the show and that the students should be centre stage. Perhaps it is just another tool for the teacher to pull out as and when needed? 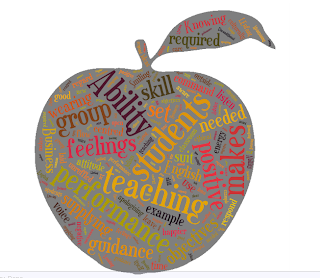 OUPELTGlobal suggested that teachers should be able to perform AND teach, rather than OR! kevchanwow and Shaunwilden talked about cognitive dissonance, where our feelings tend to align with our behaviour and that perhaps if you act warm and positive you will actually end up feeling like that, and teflerinha agreed. jo_cummins said: Often I’ll go into class feeling a bit rubbish but put a brave face on and come out feeling better. teflgeek told us that his school was popular because their lessons were more fun than the competition. He agreed that fun is subjective, but that he hopes his learners have fun at the same time as learning. It is also wise to consider the context and the type of students, as young learners are different from EAP students. As theteacherjames said: Context is always king in our business! There was a bit of grumbling about the fact that some popular teachers use fun and personality and get glowing recommendations and the support of school directors, due to producing the ‘bums on seats’ effect. It was mentioned that some teens are happy to avoid any real work and will happily settle for an easy, entertaining, lesson. Students may then unfairly measure other, hardworking, teachers against the entertainers, not always being aware that there is little substance to the lesson, although there are some students who are able to see through the smokescreen, in some cases better than the DoS! – we are a channel for learning, and our stuff can get in the way -teflerinha. If by honesty we mean being able to admit when we don’t know something, then yes- students are generally sympathetic. SophiaKhan4 thought that some distance was a good thing and that it wasn’t always a good idea to share personal information with students. Is it okay to play devil’s advocate? So the question is: how much of your true self do you take into the classroom? The answer was clear; everything except our negative feelings, although it is context and group dependent. What would make up a performance skill set?